TL2’s bonobos have different strategies in different areas across a wide ecological range. Above a group is feeding in a baie or forest clearing called Musubuku in the northern part of the Lomami National Park. On the map above, each survey grid square is 100 km2. The area within each square had at least 10km of survey effort. The surveys were done during our first years in TL2, 2007 – 2009. TL2’s bonobos are distinguished by two genetically distinct populations, separated by the Lomami River. Now we know there is marked diversity in the ecology and behavior of these bonobos as well. Bonobos occur throughout the TL2 landscape, from the open canopied forests and galleries bordering the savannas in the south through the high, closed forests of the north (see map above). At the outset, as we began explorations in 2007, we predicted that bonobos would be more abundant in the north of the landscape than in the south. Not only were the northern forests unbroken by savannas, but, compared to the south, they had a history of low human settlement with little hunting of apes. These undisturbed forests, it seemed to us, would be an ape haven. Yet the opposite seemed to be the case. Bonobos are widespread and common in the southern ecotone forests. We frequently encounter night nests and feeding sign on our inventories. A ripped Marantaceae stalk is evidence of bonobo feeding in the southern forests. Direct encounters with the apes are common. Though they rarely venture into the seasonally flooded grasslands, they are frequent around their margins. Outside the park they sometimes come right up to the edge of villages, and occasionally into the gardens where they are tolerated by at least some villages despite their crop raiding. 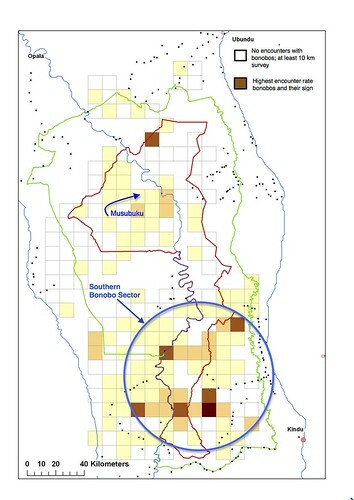 Among ourselves we refer to this area of the landscape as the southern bonobo sector (see map). In the dense forests in the north, in contrast, bonobo nesting sites are uncommon and widely dispersed, the apes themselves are encountered only infrequently. Bonobos seem to be absent or scarce over large areas of this unsettled wilderness. But why ? Clues came as we learned more about the feeding habits of bonobos, and the differences in the composition of the forest in the two regions. Terrestrial herbaceous vegetation, in particular certain species in the Marantaceae family, is very important in the diets of TL2 bonobos, as elsewhere across their range. The palatable herbaceous species are abundant in the understory of the southern bonobo sector, but rare in the dark, close-canopied forests in the north. In addition, while bonobos feed on fruits from a large number of species, their preferred foods came from only a small number of tree species. Preferred trees that are relatively common in the southern bonobo sector are rare in the north. 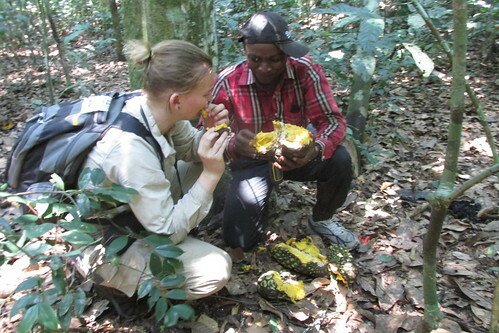 In the south, TL2 volunteer, Rachelle, with team leader, Junior, sample the bonobos’ Annonidium fruits. Differences in ecology thus appeared to play a major role in determining the distribution and abundance of bonobos across the TL2 landscape. But that still leaves unanswered just what bonobos are feeding on in the closed forests in the north of the landscape. This bonobo in Musubuku appears to be eating at least two species of plants. Camera traps have now provided a clue. 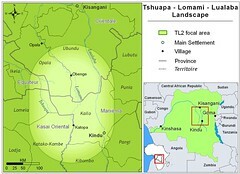 The northern TL2 contains many small, wet clearings, many just a hundred meters across or less, termed edos, or baies. 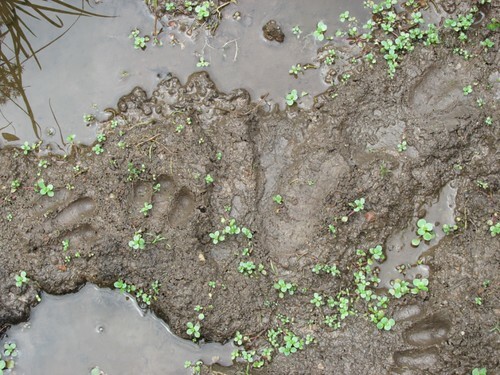 These attracted our interest as they are crisscrossed with tracks of large mammals. In 2013 we began placing camera traps at some of these clearings to record visiting fauna. Buffalo, sitatunga and bongo appeared on videos in almost all of the clearings, elephants at others. Most of these videos were recorded at night. Then, to our surprise, we began to get photos and videos of bonobos at some of the clearings during the day. In the videos the bonobos are feeding on ground vegetation growing in the clearings, sometimes wading out through mud and standing water to harvest the plants. Bonobo knuckle prints in a baie. Alerted, we began to inspect the clearings more carefully. We discovered the bonobos’ tell tale foot and hand prints associated with their feeding sign. 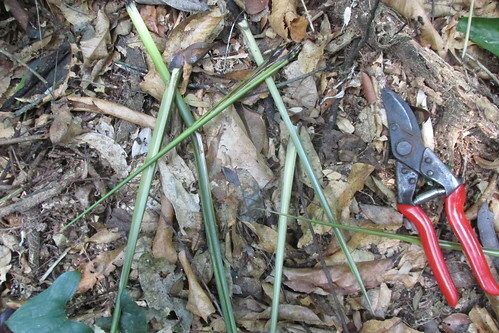 We found that bonobos were selecting not only specific plants, but also specific plant parts, usually the tender, buried meristems where new leaves are produced. The reason it seemed that we missed this evidence before, is that the day time feeding sign of the bonobos was often obliterated by the trodding and stomping of the large hoofed animals at night. Uprooted and torn apart near bonobo prints. 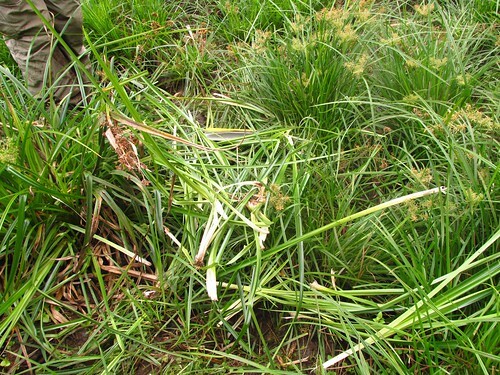 Harvesting plants in clearings, something we had never seen in the southern bonobo sector, appears to play a significant role in the feeding ecology of bonobos in the north. A leopard, too, samples the baie’s vegetation by day. Yet even as we gain new insights, further questions arise. Clearings are highly variable, and only some are used by bonobos. What are the key differences between clearings that attract bonobos and those they do not use? Nor do bonobos come to the clearings every day. Do they come at specific seasons to harvest their favorite herbs in a certain stage of growth? Where are they going the rest of the time, and what are they eating? These small discoveries about bonobos remind us how much less information we have about the north of the Park. Although twice the size of the southern sector we have only one team in the north and seven teams in the south. In 2013 elephant poaching criminals started attacking our camps and project staff at Obenge. We cut back our efforts in the north. We are now rebuilding with improved security. Our goal in 2016 is to expand monitoring and surveillance, inside and outside the park, so that we can do a major elephant census and start exploring the areas we do not yet know. As the TL2 teams follow bonobos across the northern landscape, they will lead us to answers and more questions. Already the bonobos in the baies have shown us a new importance of the clearings in the north and more questions about those in the south. This entry was written by Terese Hart, posted on 2015-11-17 at 5:33 pm, filed under Bonobo, The Forest. Bookmark the permalink. Follow any comments here with the RSS feed for this post. Trackbacks are closed, but you can post a comment. Very interesting! Just like western lowland gorilla feeding behaviour in baies from the sound of it. Will look at the videos when on a fast internet next week. Very interesting observation, Boo, and I hope you get a chance to see the videos. I think studies of clearing use by gorillas and bonobos, in context of full range of behavior and feeding ecology will reveal some very interesting commonalties as well as differences. It is clear already, as you have documented with the gorillas that clearings are important. Understanding why some clearings appear to be preferred and others avoided is a question for TL2 bonobos. Do chimpanzees use clearings ? OK back in the UK. The close-up of the bonobo eating: looks like it is doing just what gorillas do- eating the leaf bases of the sedge Rhynchospora corymbosa. The other species where the bonobo is eating the leaf base is a broadleaf plant- can’t see it well. Chimps very, very rarely use bais. Devos, C., S. Gatti & Levréro, F. (2004) New Record of Algae Feeding and Scooping by Pan t. troglodytes at Lokoué Bai in Odzala National Park, Republic of Congo. Pan Africa News, 9, 19-21.